I’ve been anticipating Goldyburgers for a long time. There are a few reasons for this. My bro-in-law, a savvy eater and keen appreciator of the finest cuisine, says it’s great. It usually ranks high on burger lists. In fact, it gets ranked numero uno (Spanish for #1) by AOL City Guide. It gets generally good reviews. Check out Centerstage and Yelp. I couldn’t find it on Metromix though. If it’s there, let me know. So one fine Saturday night, I head out to the Western ‘burbs with my wife and mother-in-law to visit the aforementioned bro-in-law. He suggests heading over to Forest Park and dining at Goldyburgers (7316 Circle Avenue) and gets no argument from me. It’s all neighborhood pub, make no bones about it. When we walked in, I was a little concerned that my wife and mother-in-law weren’t going to like the atmosphere, but they loved it. And the burgers, well, they rocked. 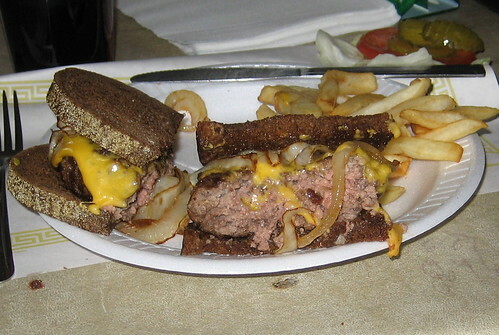 Pictured above is the patty melt, done medium. It was exceptional. If someone asked me to put together a list, it would be second only Tavish. The best feature of the Goldyburger is probably the burger-to-bun ratio. Look at that picture again, you are witnessing a ratio of probably one to one. They achieve this despite only using a half pound of beef. That’s an impressive feat. Remember, Tavish did it by pushing the size of the burger well past a half pound. Goldyburgers does it by decreasing the circumference of the half-pound of beef and fitting it on to a slightly smaller than average bun (or slice of dark rye). They executed it just about perfectly. I say “just about” because I don’t think they dropped the patty melt into a buttered skillet. I thought that was standard for a patty pelt, but maybe I’m wr…wro..wrong, although I doubt it. But this did not detract much from my enjoyment. It was a fine conglomeration of beef. I’m guessing it was a combo of ground chuck and ground round. It was juicy and full o’ flavor. They have a lot of burger options on the menu. Besides the patty melt, our table had the mushroom and Swiss burger and the bleu cheese burger. Everybody at the table was extremely satisfied. They have plenty of beer choices and several wines. It’s a great, friendly neighborhood pub and an absolute must if you consider yourself a burger connoisseur. Posted in food on 2007/07/02 by John.